Duration of production: Summer 2013 – January 2015. Milk’s primary task was to make magic utterly believable by bringing to life the natural elements used by the magicians. Milk created an impressive body of effects work throughout the series, bringing to life stone, sand, water and mud as well as a swarm of ravens. 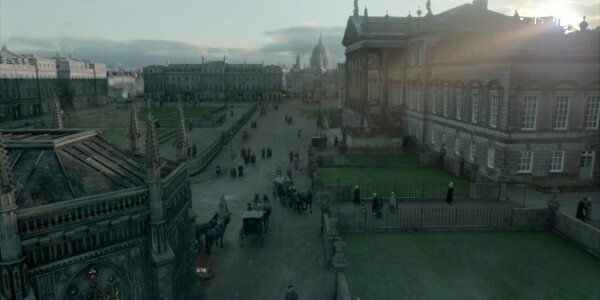 The key VFX sequences in the first two episodes include bringing the York Minster statues to life; the scene-setting opening sequence showing the Shambles and York Minster, which introduces the world of Jonathan Strange and Mr Norrell in episode 1; and the sandhorses and the fleet of rainships in episode 2. Milk’s work in subsequent episodes includes crowd and effects work on the Battle of Waterloo. 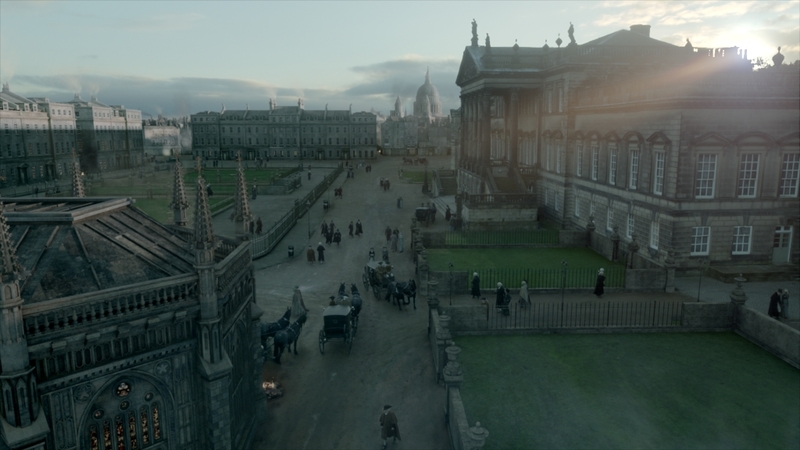 The opening wide shot when Mr Segundus leaves his lodgings in the Shambles, is first time we enter the world of Jonathan Strange and Mr Norrell. A really important scene setting shot for director Toby Haynes; it sets the tone for the entire series evoking a heightened reality with a hint of the magical and dark fairytale world. 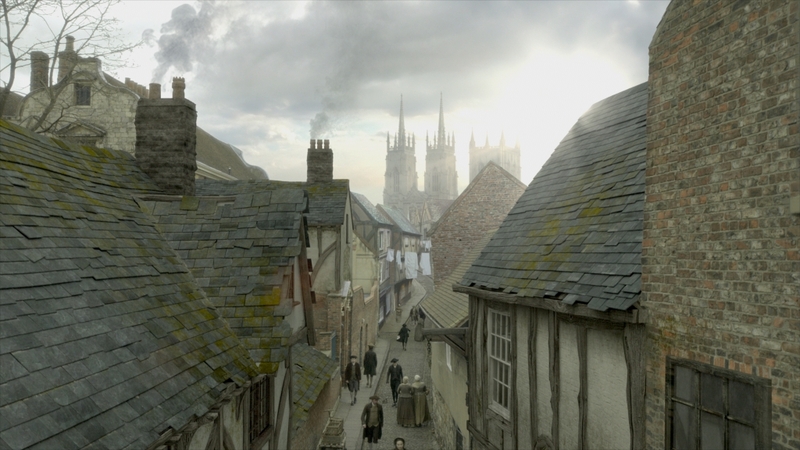 In order to overcome the logistical challenges of shooting in the Shambles, an alternative York Street was shot and recreated by Milk as the Shambles. This involved adding the entire left hand side of the street with overhanging buildings. In order to accommodate the parallax in this crane shot, Milk created a complex hybrid environment shot with fully modelled, textured and rendered 3D buildings in the foreground; 2.5D environment in the mid-ground (achieved by projecting matte paintings onto geometry in Nuke) and a flat 2D matte painting in the background: Everything you can do in one heroic crane shot. 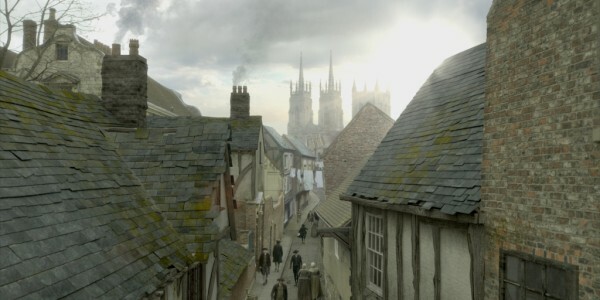 As the Milk team refined the shot Toby Haynes wanted to include hints of the magical world; to portray Georgian England based in a heightened magical reality. In order to achieve this Milk subtly bowed the buildings bringing a hint of Tim Burton style into the world. The flat matte painting in the background with ‘god rays’ add a tonal hint of the magical world the viewer is entering. The irony of the shot is that York Minster is actually behind the crane owing to the shooting restrictions in the real Shambles. 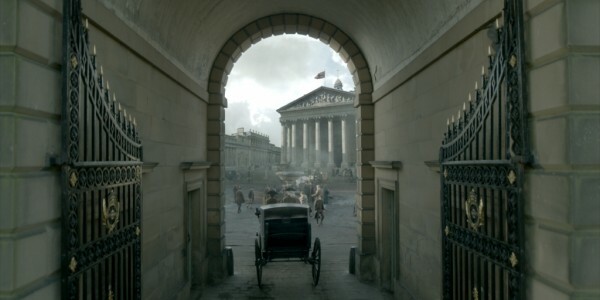 Milk worked in close collaboration with the Production Designer David Rogers – who is an expert on Georgian London to ensure that details like windows and even the size of bricks were historically accurate. Mr Norrell journeys to London and to the Houses of Parliament in Westminster Square. In order to tell the story of his journey and accurately set the scene in Georgian London, we pass through a London archway and glimpse the Bank of England and thence down Threadneedle Street where we get an alternative view of the Bank and into Westminster Square. To achieve this and bring to life the bustle of busy Georgian streets we created matte paintings and 2D crowd replication. Matte paintings and set extensions also helped set the scene for the many of the characters entrance and exits into buildings across multiple angles in Hanover St and Soho Square. 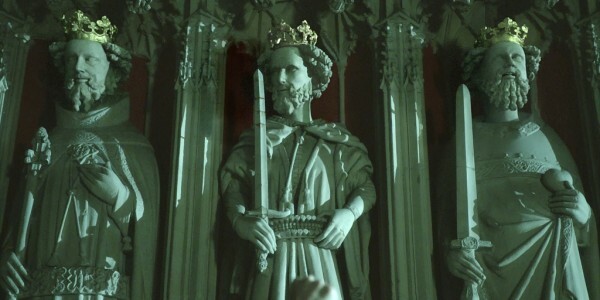 The key VFX sequence in episode one is Mr Norrell demonstrating to the York Society of Magic and therefore the world, his practical use of magic in bringing the stone statues in York Minster to life. Milk created 30 shots for the statue sequence. The challenge in animating stone objects is ensuring that they don’t look made of rubber. It was also important to ensure that they looked like realistic carved stone, in keeping with the style of sculpture for the period. Through R&D we made use of cracks and dust to maintain the feeling of stone moving. It also became apparent that the cracks in statues faces could be used to enhance their performance. 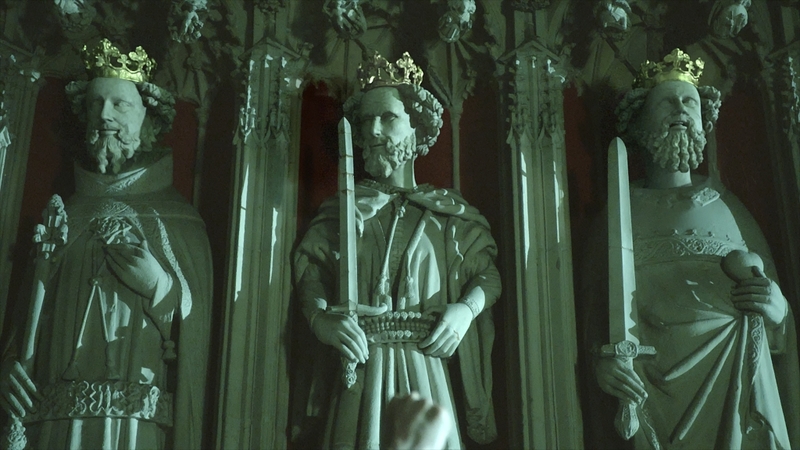 Photographic reference of the actual statues was collected on location in York Minster along with some artistic license to make fresh assets to put in situ – such as the Bishop or the gargoyles. Milk created and animated 4 different types of statues, small statues on the top of columns; the seven kings, the musicians and the Bishop. The amount of movement for each was pre-agreed. The Bishop was played by Bertie Carvel. Toby Haynes invited him to perform the part of the Bishop in a green chroma key suit; so that the actor playing opposite the Bishop had a real person to interact with for his performance – this was used as reference for the animation of the Bishop.